Baker Mountain near Greenville was purchased in late January by the Appalachian Mountain Club with the intent for the peak to remain "forever wild." Baker Mountain near Greenville dominates the landscape from First Little Lyford Pond. 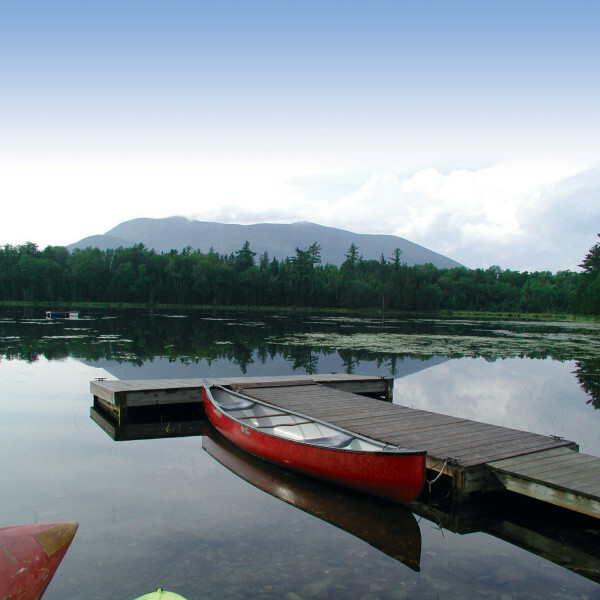 The mountain and surrounding lands was purchased in late January by the Appalachian Mountain Club with the intent for the peak to remain "forever wild." A map of the land purchased by the AMC in January 2015 (in brown) and prior (green). 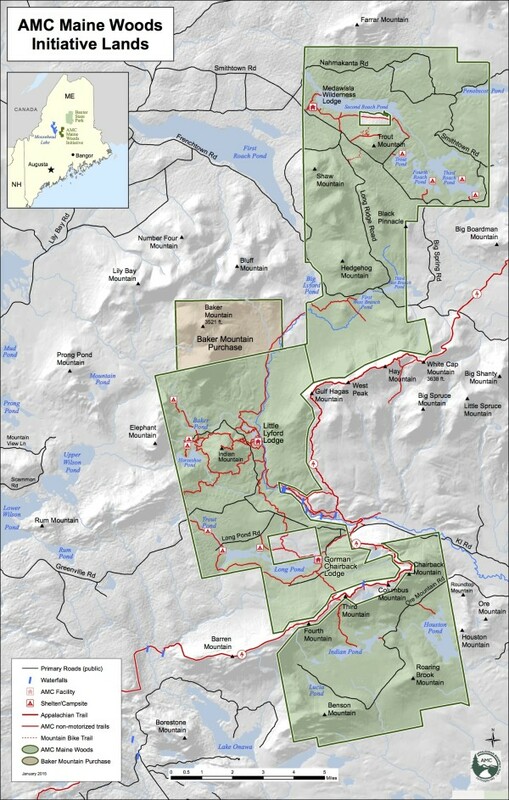 The Appalachian Mountain Club recently purchased 4,311 acres on and around Baker Mountain in Maine’s 100-Mile Wilderness region, permanently protecting the land with assistance from The Nature Conservancy. The land will be managed for a variety of uses, including recreation, habitat protection and sustainable forestry, according to a recent press release. 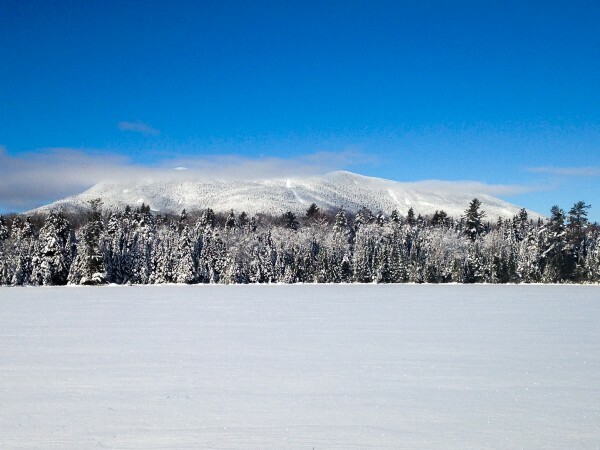 The newly conserved land, purchased by AMC in late January, lies within an unfragmented roadless area of mature hardwood and softwood forest and includes Baker Mountain, which at 3,521 feet above sea level is the second-tallest peak between Bigelow Mountain and Katahdin. The land also includes the headwaters of the West Branch of the Pleasant River, a wild brook trout fishery, as well as forest that is habitat of the rare Bicknell’s thrush. AMC purchased the land in two adjacent parcels: 3,111 acres from the Prentiss and Carlisle Group and Plum Creek Timber Co., and a separate parcel comprising 1,200 acres from Plum Creek. Land acquisition, establishment of a stewardship endowment fund and related costs totaled about $2.4 million, according to Graff. The Nature Conservancy, a key partner in the acquisition, now holds a “forever wild” conservation easement on the first parcel covering about three-quarters of Baker Mountain, including its 3,521-foot summit. The second parcel is now permanently protected by the Moosehead Regional Conservation Easement, held by the Forest Society of Maine. AMC will maintain the land for non-motorized sports, allowing activities such as hiking, hunting, fly fishing and cross-country skiing. Trails will be developed in the near future, said Graff, including a trail to the summit of Baker Mountain, which affords stunning views of Moosehead Lake and surrounding mountains. The Baker Mountain acquisition was made possible in large part through a significant contribution by Steven C. Leuthold and his family, as well as donations from a small group of AMC donors. Another important funding source for this land acquisition was the sale of verified carbon emission offset credits, known as Climate Action Reserve-registered credits, from AMC’s 10,000-acre ecological reserve, where AMC encourages natural forest growth to preserve stored carbon. “We’re excited to be able to help reduce atmospheric carbon while at the same time using these revenues to directly support land conservation,” said Graff in a prepared statement. The 4,311-acre acquisition is the latest milestone in AMC’s Maine Woods Initiative, a plan for land conservation in the 100-Mile Wilderness region. It brings AMC’s conservation and recreation land holdings in the region to about 70,000 acres. For information about AMC and its Maine Woods Initiative, visit outdoors.org.